Continue on a fascinating journey through the history of online gaming as seen through the eyes of The Syndicate, one of the oldest and most successful player organizations in the history of gaming. Learn the secrets to creating, maintaining and growing your own stable online community. More than fifteen years of Syndicate experience are boiled down into a formula for success that you can apply to your guild. Time tested methodologies and lessons are shared to help you create success for yourself and your friends. Look into the future of MMORPGs. The key to the future success of online gaming is meeting an ever changing set of player expectations. We explore how developers can and should meet them in the years ahead. The successful games of the future will be the ones nimble enough to meet those expectations. Also included are forewords by John Smedley (President of Sony Online Entertainment) and Curt Schilling (Founder of 38 Studios and 3 Time World Series Champion). Well, first off, I am not a gamer. My gaming tastes never went beyond Sims 2, Heroes of Might and Magic III and Magic The Gathering (and none of them in the online gaming mode). I have never played World of Warcraft (shocking, I know), even though both my parents are Wow-players. Mind boggling, right? I’m not a gamer, and I don’t really think I’ll be much of a gamer, ever. So, from that regard, I can’t really say how helpful this book may be to better your gaming whatnots; but I am a community developer, and I can tell you this: community-building wise, this book is a hit. I won’t linger on that aspect a lot, but the S.U.C.C.E.S.S. thing is beyond awesome. That is why I do strongly encourage you to read this book, even if, like me, gaming is not quite a top item on your list of interests or preoccupations. The writing itself is really good; the Syndicate’s evolution, and the team building content is set up in a charming, nifty little frame; you enter the book as a guild-wanna-be, and exit it as an initiate. You can tell the writing is pretty awesome right from the start. Of course, the fantasy story-telling is the intro and outro, but the great writing is not by any means limited to them. If you ask me, when the content is not per-se in my zone of interest, but I’m glued to the screen until your book is over, then you can do magic with words. Real magic. As you can tell, I loved the experience of reading this book. I’m not going to say I was riveted (for reasons mentioned above), but I loved reading it. Would my rating have been different if gaming was more of interest of mine? You bet. The book managed to get me hooked while reading on a topic I’m not much interested in, if that’s not good writing, I don’t know what is. 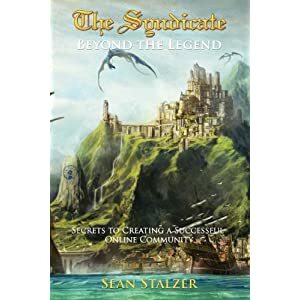 I also found it interesting to fallow the development of this solid community, and I’m happy the author did give us a brief overview of the entire evolution, even though this is the second Syndicate book released, the first one being Legend of the Syndicate. You can check that out at Lulu, here. Of course, it goes without saying, if gaming and MMORPG’s are among your top interests, this is not a book to miss out on; it’s witty, well written, interesting and informative. It’s a SUCCESS, to make a long story short.